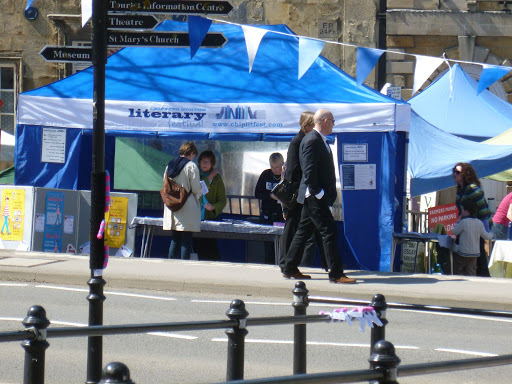 It hardly seems possible that a week has passed since the Chipping Norton Literary Festival (or ChipLitFest as it is affectionately called) took place. 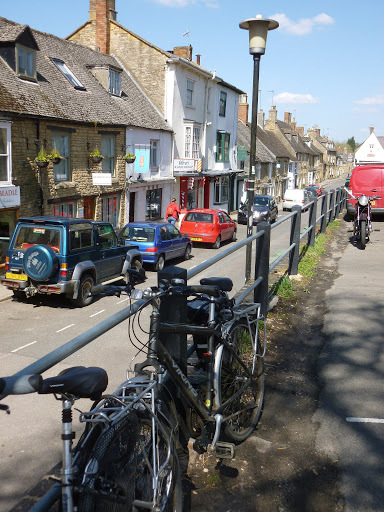 For four days the small, market town situated on the edge of the Cotswolds hosted eighty of the best authors to be found anywhere – a remarkable feat for a festival still in its infancy. For the eleven of us on the committee the past year has been an endless round of meetings, venues to be visited, volunteers to be found and co-ordinated, emails to be sent, publishers and agents to be contacted and authors to be booked. Fortunately, our meetings have always been enjoyable and any stress negated by copious amounts of food, wine and strong coffee. These are an absolute necessity for none of the committee receive any payment whatsoever so meetings have to be fitted around busy work schedules in the evenings. Perhaps if we had ever worked out how much the meetings cost the individuals hosting them there would have been a mass resignation. The first two days of the festival are focused on children with authors visiting all of the local schools, speaking and reading and encouraging them to become better readers and writers. The story writing competition was well supported; the winning entries can be read by clicking here. 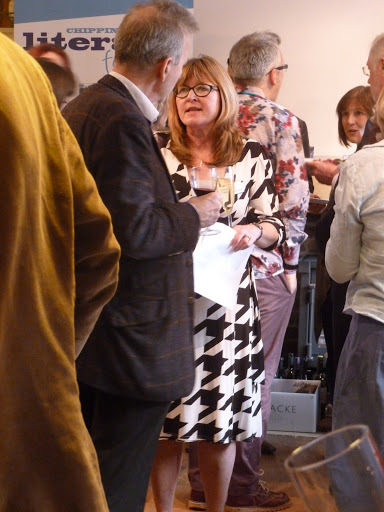 The authors and patrons were guests of honour at a reception held in the town centre on Friday evening and gave them the chance to network and to meet the committee and sponsors in a relaxed and informal way. 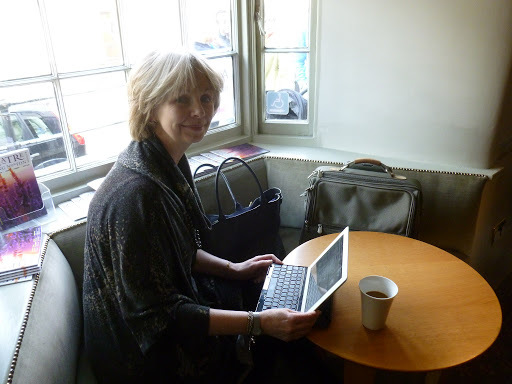 My role in the festival has been Author Liaison so I was especially keen to speak with as many of them as possible – it was good to be finally able to meet face to face after many weeks of messages and telephone conversations. 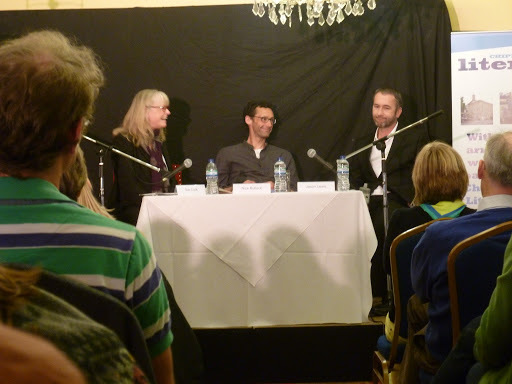 The following evening myself and Merilyn Davies, the children’s programme co-ordinator, hosted a dinner for the authors and, as many events had taken place by then, we were all realising just how successful the festival was becoming. At the reception our designated charity Storybook Dads gave a short explanation of their amazing work inside some of the UK’s toughest jails. Their film was uplifting and heart-breaking all at the same time and it was wonderful that the festival was able to present a cheque to them for five hundred pounds. They are now out in Afghanistan too, helping servicemen keep in touch with their children. A short video montage of their work can be seen here. It wasn’t just the committee that welcomed our guests for the whole town has taken the festival to its heart: the local window cleaners had put up yards of bunting, shops and cafes were offering special promotions and the farmer’s market was held over two days instead of the usual one day. Festival goers were appreciative of this and with warm, spring sunshine finally making an appearance the atmosphere was electric. One of the drawbacks of being involved in putting on an event – and I wouldn’t have changed places for a second – is that there is little time for us to actually see any of the talks or workshops. However, I did manage to sneak into a few places to take a quick photograph or two. 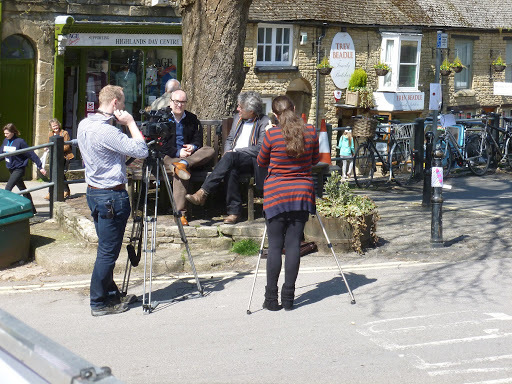 Both the local and the national press came to town too. 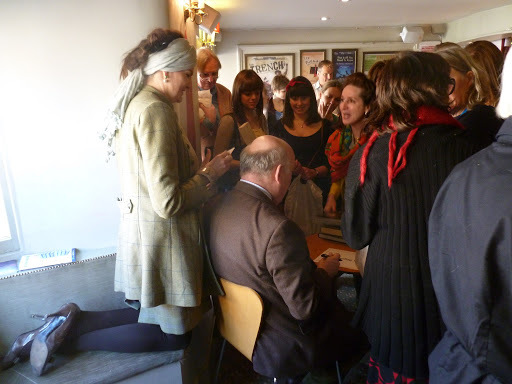 David Freeman, past presenter of Sky television’s The Book Show, was busy interviewing and filming authors. I, too, was interviewed by him about my forthcoming book Why Can’t My Garden Look Like That? published next month. 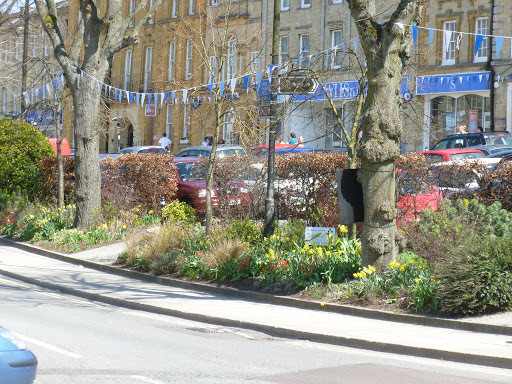 This entry was posted in ChipLitFest, Chipping Norton, Cotswold Hills, cotswolds, Facebook, farmer's market, literary festival, spring, Storybook Dads, Twitter and tagged Clive Aslet, David Freeman, Jason Lewis, Julian Fellowes, Lalla Ward, Nick Bullock, Sue Cook by johnshortlandwriter. Bookmark the permalink. Sounds like a wonderful event, I'll have to be content reading your account of it, though.